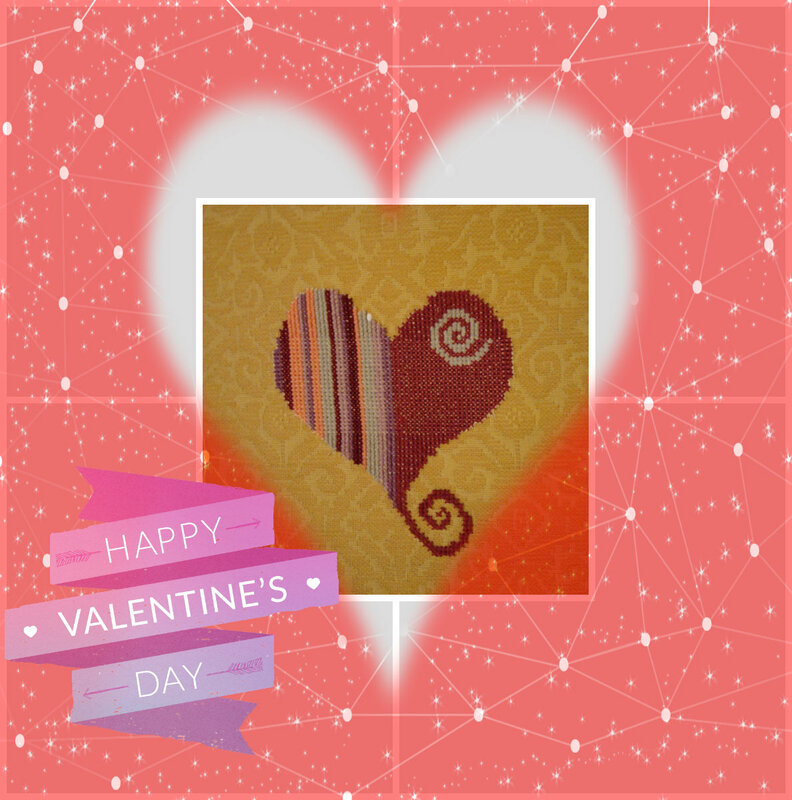 Happy Valentine's Day and welcome to the Secret Stitching Sweetheart Blog Hop. Over the last few weeks I have been receiving some lovely photos of love through the email. At the weekend I emailed them out to the participants in this year's blog hop to display on their blog and wait for their Secret Stitching Sweetheart to come and comment. It's not quite an FFFO (Finally Fully Finished Object) because I realised that I didn't have any pink or red felt for the base. The design is from the Amint Kipattan blog. There are lots of different hearts there, look up "sziv" in the sidebar. I hadn't noticed the little ribbon roses when I printed the chart out! There's a first time for everything though and they look OK. I stitched this on 32 count Pink Belfast linen from Zweigart using my own DMC colours and some random beads. Which need reattaching where I caught them on the invisible thread! I also changed the leaves to satin stitches. Finally, I've been making great progress on my Chatelaine but I'll keep it short today as you all have a lot of blogs to visit for the hop and I'll be back tomorrow for Gifted Gorgeousness. Oh great, the blog hop starts. I have already seen some posts in my reader and will visit the respective blogs soon. A great heart that you stitched and finished this year. I also love stitching hearts very much and there is always a heart WIP in my WIP bin. A wonderful collage. I love the heart design that you stitched. I must download a copy of that design. A great collage of hearts. That's a seriously cute heart you made :) You seem to be getting the hang of those cube finishes now! I just got my own post for today online and I'll go look at everyone's posts later in the day. Lovely heart finish Jo. As much as I like heart patterns, I haven't stitched even one yet..need to work on this. A blog full of hearts,very appropriate for today:) I do like your cube finish it looks great.I have just been hopping around enjoying the stitching other participants have received. Thanks again,Jo and Happy Valentine's Day. Great collage of hearts Jo, and I love the ribbon accents on this year's. Congrats on all of the lovely finishes Jo. Wohoo another fun blog hop. I'm off to hop around. Thanks for being the wonderful host you are! Love the beautiful finish you have and the ones you have done before. Happy Valentine's Day! I'm enjoying hopping round. Your cube finish is so sweet! Such a pretty pink Valentine's Heart that you stitched, my dear - just so sweet! Thanks for hosting such a great Blog Hop. Hi! 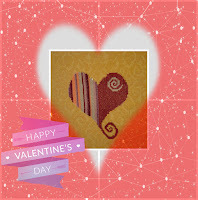 Great Blog Hop, I'm travelling, visiting and I found my Valentine's work has reached Stitch Niche. My secret stitcher is still mysterious now! I haven't drink enough coffee today! The fun will continue tomorrow! Love. Joyeuse Saint Valentin ! I've enjoyed visiting and commenting on all the blogs on the hop, and getting to know a couple of "new to me" bloggers, Jo! Thanks for organising the hop, its been such fun! The little ribbon flowers are lovely, something I have yet to try, its on the list to do one day. 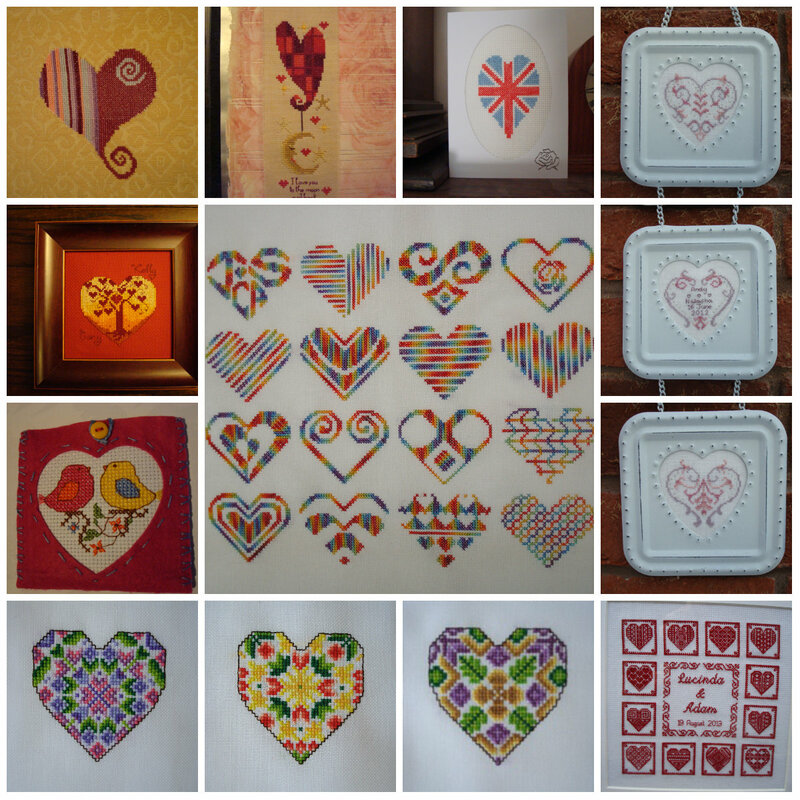 Nice collage, I've enjoyed looking at all the lovely Valentines in the blog hop. I hope you had a great Valentine's Day! I will start the blog hop today! I edited my blog post and added the photo of my stitched piece too as well as the name of the recipient of my photo and of the sender of the one I got. I hope that's ok with the rules of the game. Thanks for organising this!And I love all the hearts you have made!AriadnefromGreece! Beautiful. I love all the hearts.